The Cumberland & Dumfriesshire Farmers Mart P.L.C. had forward 966 store hoggs & 801 ewes with lambs at their weekly sale at Longtown on Tuesday 27th April 2010. Store hoggs were a similar trade, selling to a top of £85.50 and £84.50 for Charollais from Lochwood; Suffolk £69 Linton; Texel £78.50 Candybank; Greyface £65.50 Candybank; Blackface £59.50 Linton; Swaledale £53 Hepplehill; Cheviot £56 Linton; Kerry £55.50 Candybank. 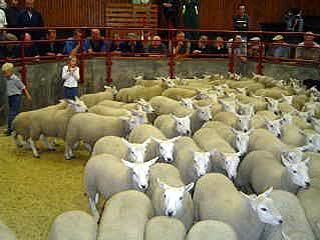 Cast ewes to £127 Candybank, hill types £64 Carpet, cast rams £87 Lochwood. A larger show of ewes with lambs at foot was forward with trade dearer. Shearlings with twins sold to £64 for Suffolks from The Courtyard; Texel £63 High Dovecote; Greyface £57 Henrys Hill. Ewes with twins to £58.50 and £58 for Greyface from Drumcork; Texel £58 West Wharmley; Cheviot Mule £55.50 High Dovecote and West Wharmley; Suffolk £50 High Dovecote; Blackface £26 Clover Hill. Ewes with singles to £60 for Texels from Lochwood; Cheviot Mule £59.50 High Dovecote; Greyface £57 Church View; Swaledale £33 Hardhurst; Blackface £32.50 Clover Hill. Greyface gimmer hoggs to £64.50 Candybank.